A complete seating system available in a range of structures with a choice of wood, chromed or painted (in the same colours of the seat) metal or steel base. The Vad pays a tribute to the tradition of the Scandinavian masters. The body of the chair, durable and striking, is produced in recyclable reinforced polypropylene by means of injection moulding in a single block. 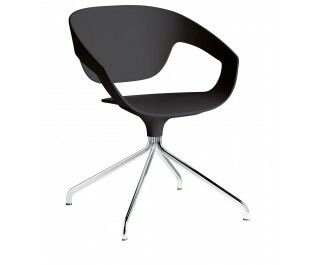 Also available with swivel base, the Vad chair offers stackability and is suited indoor as well as outdoor spaces, making it a fit for both contract and domestic environments. The seat is available also with fabric, leather or full-grain hide.